The Adrian Brinkerhoff Foundation is dedicated to the dissemination of knowledge about classical literature, specifically poetry, prose, and drama, through publishing, media, audio, video, and education. This month we celebrate Dylan Thomas Day, the day (May 14th, 1953) that this amazing play, Under Milk Wood, was read at the 92nd Street Y in New York City. Thomas finished it only a minute before performing it. In future months we will feature Richard Wilbur, Archibald MacLeish, James Merrill, John Donne, Emily Dickinson, W. H. Auden, and others. Under Milk Wood was read by Dylan Thomas at the 92nd Street Y in New York City on May 14th, 1953, a minute after he finished writing it, some 64 years ago almost to the day. In fact, that day has been chosen as International Dylan Thomas Day. Thomas’s life in the States was chronicled by John Malcolm Brinnin, who kept him company during those years, in the gossipy and essential Dylan Thomas in America. Like Chopin, there has been no one before or after Thomas who wrote like that. He was a hellraiser, whose antics in bars were legendary, a fascinating but tragic side to one of the greatest poets in the language, whose words and rhythms, along with Shakespeare, were the fuel behind Richard Burton’s and Peter O’Toole’s romantic personae (see the book, Hellraisers, by Robert Sellers). Thomas created a unique era of Celtic genius and bad behavior by intellectuals who should have known better, the bar against which all extrapoetic license must be measured. We have to love them all for it secretly, behind our high moral lecterns. 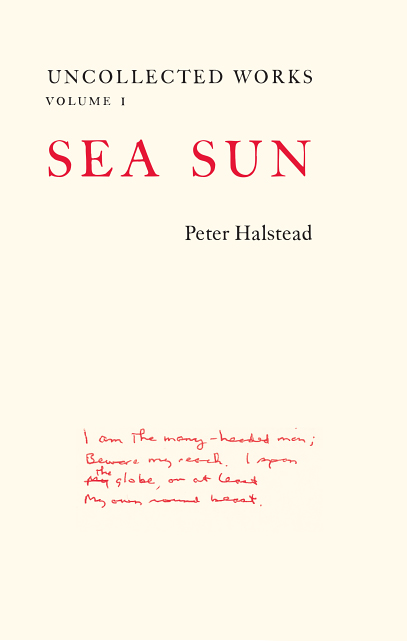 Published in 2012, Peter Halstead's Sea Sun explores uncharted lyrical territory. Sea Sun brings together an array of prolific poems. Peter's visionary writing brings his readers into an original and inventive space. Sea Sun is an adventurous escape into astounding poetry! Published in 2009, Blinds is the first of Peter Halstead's works. Peter's eloquent writing powerfully reflects his compassion for the people and places he holds dear. His devolution to his craft gleams through his articulate, inventive poetry drawing his readers into his personal journey. Blinds is an invitation to venture through the creative and clever thoughts of an innovative author. The Adrian Brinkerhoff Company is honored to present this collection of inspired works! Rather than the straightforward descent from a monastery in the Khumba Valley, using the traditional Everest Base Camp route, a motley crew who never should have been there in the first place- a concert pianist, his piano tuner, a piano, a corpse, a Valley Girl (from the wrong valley), a desperate political fugitive, a born-again Buddhist - head deeper into wild mountains, at the end of which there is no food and no return - only one will return to tell the story. These are the last photos of that disastrous flight into stupidity and madness. I would open two French doors until one pane reflected a pane on the opposite door, so I had two combined reflections. I would move the doors until I got a beach umbrella, the blue sea, another superimposed umbrella, something on the side of the restaurant like a bicycle, as well as the wine glasses and the table flowers through the glass to add color to my collage. I fortunately never noticed the outraged diners until I was leaving (rarely voluntarily). All 13 of the Opus 32 preludes were written over a period of 19 days, as if Rachmaninoff knew he had only seven years left of the paradise he had inherited, and had to make use of each minute. After his 1897 First Symphony, he was savaged by critics and lost his will to compose for more than two years, until the hypnotist Nikolai Dahl, to whom the second Piano Concerto is dedicated, talked Rachmaninoff into believing in himself once again. After 1900, he never looked back. The 12th Prelude in G-Sharp Minor features one of his great Russian harmonic signatures, the sudden descent from major to minor, a threnody which we hear today in science fiction film scores. Sibelius used it at the beginning of Finlandia as a clarion call, a fanfare announcing a great event. This same motif of major-minor is repeated throughout the melody in the left hand. It contains an immense sadness, the sorrow of the steppes, the Chekhovian mourning for lost Russia which every Russian seems to carry in his blood. Above the falling sadness, bells peal across the moors from the Moorish onion domes of the church carillons, signaling the moments of prayer in the Russian orthodox day. This falling motif isn’t only an onomatopoeia of the steppes, but also an imitation of snow falling from pillowed dacha roofs in winter, from cathedral ballustrades in Moscow; it is an eidolon, a spiritual double, for the sudden gusts of wind that cause the falling snow. These gusts sweep the soul from elation to fear in half a second, the thrill of nature unleashed partnered with an unexpected fibrillation of insecurity in the face of cosmic forces. We know instinctively that the scoop of wind comes from atmospheric layers beyond our reach, from the turning of the earth, from the wobbling precession of planetary axes, from the vast imbalances between overpopulated thermal zones and voids spread throughout space. This cosmic pulse, this skip down the ziggurat of electron levels in atoms causes atomic reactions, energy exchanges, gravity, solar storms, and, on our level, changes in barometric pressure, snow clumps that drift and fall from wheat fascicles to the blanket of snow beneath. It’s a small phenomenon, like snow itself, but it is ripe with divinity, with forces beyond our comprehension. It’s a metaphor by which our understanding of the world transitions from the observable to the unknowable. We register this with a sudden muscular throb, a skip of the heart, holding of the breath, a gap into which adrenalin courses, physiology that alerts our minds to miracles, to acts of nature whose shadows we notice, but whose instigators - numina, umbras, specters, demons - remain just beyond our vision. This same spectral falling motif recurs in the second section. The third section fills in the missing notes in the falling motif, to flesh out the vision with a more discernible descending scale of the melody, as if the wind, the energy were made visible. The fourth section puts that descending spectral hint at the bottom of the left hand, while a figure in the treble, the imagination, climbs upwards towards the heights even as the feet disappear into the snow. Rachmaninoff, despite his tendency to depression and self-abnegation, is brought along despite his modesty by a talent outside himself into unconscious heights his ego would deny, but which his creative spirit entertains. We are brought outside our own bodies by elements in us that respond magnetically, chemically, spiritually to the transfigurative universe. In the middle of the ostinato figures in the treble are hidden the sinking fourth notes which imitate the closer one- or two-note spectral down drafts between notes in the beginning of the piece. These wider drifts approximate the Dies Irae, the Day of Wrath melody which connotes Doomsday. But Rachmaninoff doesn’t go that far; he keeps the tonalities anchored to the plagal modes of bells, the Byzantine harmonies to which bells are tuned. So bells appear to speak in pidgin tones, handicapped by missing notes. And yet Gregorian chant, restricted as it is to only churchly harmonies, resonates with the primal power of its prim vocabulary. In the fifth section a rising plagal scale emerges out of the bass to bring the piece back to its beginnings, and in so doing to its ends. Instead of single notes bemoaning the leaden sky of the flat Russian horizon, now enormous bells ring out the plagal theme in the bass. The descending six-note scale in the bass is inverted into the subtle climbing scale hidden in the midrange, usually not heard in the rush of concert performances. Bringing out this inner scale in the midst of its surrounding voices is difficult. It requires a dedication to the deeper innards of the piece, rather than just to its coruscating surface. In the end, the tolling of the Angelus subsides; its ave maria della sole bells go silent with the coming of evening. The bells of evening are dedicated to St. Gabriel, who announced to Mary that she was going to be the mother of the son of God: ave maria, gratia plena, Dominus tecum, benedicta tu in mulieribus, et benedictus fructus ventris tui: Iesus. These Ave bells hailed the divine in humanity, and wrote over the earlier pagan curfew bells that warned the community to seal the gates of the village against the demons and goths of night. War was written over with peace. The presence of the church spire and its hidden carillon of bells dominated the flat landscape of the Russian steppes, and was a grounding (and uplifting) feature of the countryside in which Rachmaninoff and Nabokov grew up, and to which they returned as often as possible before the revolution destroyed their estates and erased their identities in the most brutal of ways, with beloved serfs themselves torching the houses in which their own families had entwined for generations with those of the owners, eliminating with a match the spirit of community which was the trellis on which the countryside grew. Rachmaninoff had put all his concert earnings, all the spoils of his genius, into his family’s lands, which went back into the prehistory of Tatar and Kazak conquests, seemingly immortal proof of the stewardship of land and community withwhich great Russian genius was entwined, which gave it social resonance, meaning beyond mere words and notes. It is this inextricable alliance between the trees, streams, soil, and villages of the vast countryside outside Moscow and St. Petersburg which weaves the intricate labyrinth of Russian inspiration into the writings of Tolstoy, Chekhov, Turgenev, Bely, Goncharov, and Nabokov, and into the music of the great Russian composers: Glinka, Rimsky, Balakirev, Borodin, Mussorgsky, Tchaikovsky, and Rachmaninoff, which continued on in coded references in Prokofiev and Shostakovich and in Stravinsky, who escaped the Stalinist terror and was free to integrate European influences into his identity. We are distanced by time and geography and temperament from the significance of bells sounding over the vast ragged wastelands where the great Russians wrote most of their music, but their exile from their inspiration and the pain which that loss entailed was omnipresent in Europe between the World Wars. After World War II, the survivors of Hitler learned to hide their immense grief. Two great examples of this are Nabokov’s novel Pale Fire, where he puts his own history into the raving footnotes of a megalomaniac academic pretender, aware how his own reality was seen by a New World which was so distant from the immense disruptions in Russia and Europe; and Rachmaninoff’s Rhapsody on a Theme of Paganini, written at Villa Senar in Switzerland, which served Rachmaninoff as a proximite Swiss outpost of his lost kingdom. The only genuine niche Russians had carved out for themselves in America was as geniuses. Bellow, Gershwin, Nabokov, Piatigorsky, Rostropovich, Rachmaninoff moved through society without really being part of it, imposing their own visions gently on the artistic future of the New World, where the profound snowscapes of their lost culture remain visible in TheNutcracker Suite each Christmas, in Nabokov’s Speak, Memory, in every performance of Rachmaninoff’s Piano Concerti, and in the smaller windows opened by his Etudes Tableaux and his Preludes. So now, as the sun sets over the snowing steppes, the sparkling overtones of the bells fade away, but one final scale rushes up into the sunset towards the similar sparkles of the night sky. The inner scale developed over the last few pages has become the deep point of the prelude’s vision of a wintry countryside cloaked in peace. Hidden inside the figures that swirl like Van Gogh’s solar thermals is a very craftsmanlike, utilitarian ascension which contradicts the eddies, the chaos, the Walpurgisnacht of the whirling leaves of the early notes. The heat waves of fall are giving way to the more directed cold fronts of winter. Notes stand in for breezes and harmonies borne on the wind, as if the sky is painted by numbers, and the mathematics of vortices finally compresses abstract and disconnected wraiths into a very linear template of thermodynamics. The pagan spirals of the opening arpeggios have been exorcised by the midsection’s benediction into the final resurrection of the ending. Interestingly, the great virtuosos, Horowitz and Hamelin, are the most detailed in their performances at bringing out the different voices lurking in the lacy filigree of the themes. Their initial wild arpeggios are structured, and each resounding echo in the sky, at the top of each arpeggio, has a grounding bass note below. It is beneath this dance of devils, this gnomenreigen, that the bells of Russian history mournfully begin to state the sorrow of the human condition which, although burdened with the sins of Stalin, the flaws of the Tsars, will through sheer dogged energy emerge into the Fabergé’d New World sky of rust and redemption. This is to make Proust out of a short prelude, but it follows from my teacher’s insistence that each note is life and death, each chord is a story, each phrase a history that must radiate in its intensity the immense connotations it contains. The wheat fields just beyond the concert barn at Tippet Rise are a bit more rolling, but convey the sense of the tundra of Rachmaninoff's steppes.